Constantine VII Porphyrogennetos or Porphyrogenitus ("the Purple-born", that is, born in the porphyry (a hard, purple-colored, decorative stone) paneled imperial bed chambers; Greek: Κωνσταντῖνος Ζ΄ Πορφυρογέννητος, translit. Kōnstantinos VII Porphyrogennētos; 17–18 May 905 – 9 November 959) was the fourth Emperor of the Macedonian dynasty of the Byzantine Empire, reigning from 913 to 959. He was the son of the emperor Leo VI and his fourth wife, Zoe Karbonopsina, and the nephew of his predecessor, the emperor Alexander. Most of his reign was dominated by co-regents: from 913 until 919 he was under the regency of his mother, while from 920 until 945 he shared the throne with Romanos Lekapenos, whose daughter Helena he married, and his sons. Constantine VII is best known for his four books, De Administrando Imperio (bearing in Greek the heading Πρὸς τὸν ἴδιον υἱὸν Ῥωμανόν), De Ceremoniis (Περὶ τῆς Βασιλείου Τάξεως), De Thematibus (Περὶ θεμάτων Άνατολῆς καὶ Δύσεως), and Vita Basilii (Βίος Βασιλείου). His nickname alludes to the Purple Room of the imperial palace, decorated with porphyry, where legitimate children of reigning emperors were normally born. Constantine was also born in this room, although his mother Zoe had not been married to Leo at that time. Nevertheless, the epithet allowed him to underline his position as the legitimized son, as opposed to all others who claimed the throne during his lifetime. Sons born to a reigning Emperor held precedence in the Eastern Roman line of succession over elder sons not born "in the purple". Constantine was born at Constantinople, an illegitimate son born before an uncanonical fourth marriage. To help legitimize him, his mother gave birth to him in the Purple Room of the imperial palace, hence his nickname Porphyrogennetos. He was symbolically elevated to the throne as a two-year-old child by his father and uncle on May 15, 908. In June 913, as his uncle Alexander lay dying, he appointed a seven-man regency council for Constantine. It was headed by the Patriarch Nicholas Mystikos, the two magistroi John Eladas and Stephen, the rhaiktor John Lazanes, the otherwise obscure Euthymius and Alexander's henchmen Basilitzes and Gabrielopoulos. Following Alexander's death, the new and shaky regime survived the attempted usurpation of Constantine Doukas, and Patriarch Nicholas Mystikos quickly assumed a dominant position among the regents. Patriarch Nicholas was presently forced to make peace with Tsar Simeon of Bulgaria, whom he reluctantly recognized as Bulgarian emperor. Because of this unpopular concession, Patriarch Nicholas was driven out of the regency by Constantine's mother Zoe. She was no more successful with the Bulgarians, who defeated her main supporter, the general Leo Phokas, in 917. In 919 she was replaced as regent by the admiral Romanos Lekapenos, who married his daughter Helena Lekapene to Constantine. Romanos used his position to advance to the ranks of basileopatōr in May 919, to kaisar (Caesar) in September 920, and finally to co-emperor in December 920. Thus, just short of reaching nominal majority, Constantine was eclipsed by a senior emperor. Constantine's youth had been a sad one due to his unpleasant appearance, his taciturn nature, and his relegation to the third level of succession, behind Christopher Lekapenos, the eldest son of Romanos I Lekapenos. Nevertheless, he was a very intelligent young man with a large range of interests, and he dedicated those years to studying the court's ceremonial. Romanos kept and maintained power until 944, when he was deposed by his sons, the co-emperors Stephen and Constantine. Romanos spent the last years of his life in exile on the Island of Prote as a monk and died on June 15, 948. 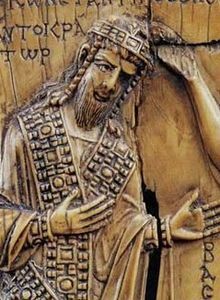 With the help of his wife, Constantine VII succeeded in removing his brothers-in-law, and on January 27, 945, Constantine VII became sole emperor at the age of 39, after a life spent in the shadow. Several months later, Constantine VII crowned his own son Romanos II co-emperor. Having never exercised executive authority, Constantine remained primarily devoted to his scholarly pursuits and relegated his authority to bureaucrats and generals, as well as to his energetic wife Helena Lekapene. In 949 Constantine launched a new fleet of 100 ships (20 dromons, 64 chelandia, and 10 galleys) against the Arab corsairs hiding in Crete, but like his father's attempt to retake the island in 911, this attempt also failed. On the Eastern frontier things went better, even if with alternate success. In 949 the Byzantines conquered Germanicea, repeatedly defeated the enemy armies, and in 952 they crossed the upper Euphrates. But in 953 the Hamdanid amir Sayf al-Daula retook Germanicea and entered the imperial territory. The land in the east was eventually recovered by Nikephoros Phokas, who conquered Hadath, in northern Syria, in 958, and by the general John Tzimiskes, who one year later captured Samosata, in northern Mesopotamia. An Arab fleet was also destroyed by Greek fire in 957. Constantine's efforts to retake themes lost to the Arabs were the first such efforts to have any real success. Constantine had active diplomatic relationships with foreign courts, including those of the caliph of Cordoba Abd ar-Rahman III and of Otto I, Holy Roman Emperor. In the autumn of 957 Constantine was visited by Olga of Kiev, regent of the Kievan Rus'. The reasons for this voyage have never been clarified; but she was baptised a Christian with the name Helena, and sought Christian missionaries to encourage her people to adopt Christianity. According to legends, Constantine VII fell in love with Olga, however she found the way to refuse him by tricking him to become her godfather. When she was baptized, she said it was inappropriate for a godfather to marry his goddaughter. Constantine VII died at Constantinople in November 959 and was succeeded by his son Romanos II. It was rumored that Constantine had been poisoned by his son or his daughter-in-law Theophano. Gold solidus of Constantine VII Porphyrogennetos, 913–959. Constantine VII was renowned for his abilities as a writer and scholar. He wrote, or had commissioned, the works De Ceremoniis ("On Ceremonies", in Greek, Περί τῆς Βασιλείου Τάξεως), describing the kinds of court ceremonies (also described later in a more negative light by Liutprand of Cremona); De Administrando Imperio ("On the Administration of the Empire", bearing in Greek the heading Προς τον ίδιον υιόν Ρωμανόν), giving advice on running the Empire internally and on fighting external enemies; a history of the Empire covering events following the death of the chronographer Theophanes the Confessor in 817; and Excerpta Historica ("Excerpts from the Histories"), a collection of excerpts from ancient historians (many of whose works are now lost) in four volumes (1. De legationibus. 2. De virtutibus et vitiis. 3. De insidiis. 4. De sententiis.) Also amongst his historical works is a history eulogizing the reign and achievements of his grandfather, Basil I (Vita Basilii, Βίος Βασιλείου). These books are insightful and of interest to the historian, sociologist, and anthropologist as a source of information about nations neighbouring the Empire. They also offer a fine insight into the Emperor himself. He was, we are told, a passionate collector—not only of books and manuscripts but works of art of every kind; more remarkable still for a man of his class, he seems to have been an excellent painter. He was the most generous of patrons—to writers and scholars, artists and craftsmen. Finally, he was an excellent Emperor: a competent, conscientious and hard-working administrator and an inspired picker of men, whose appointments to military, naval, ecclesiastical, civil and academic posts were both imaginative and successful. He did much to develop higher education and took a special interest in the administration of justice. In 947, Constantine VII ordered the immediate restitution of all peasant lands, without compensation; by the end of his reign, the condition of the landed peasantry, which formed the foundation of the whole economic and military strength of the Empire, was better off than it had been for a century. He felt that the historical studies were being seriously neglected, mainly because of the bulk of the histories. He therefore decided that a selection under fifty-three titles should be made from all the important historians extant in Constantinople; thus he hoped to assemble in a more manageable compass the most valuable parts of each author. ... Of the fifty-three titles into which the excerpts were divided, only six have survived: de Virtutibus et Vitiis; de Sententiis; de Insidiis; de Strategematis; de Legationibus Gentium ad Romanos; de Legationibus Romanorum ad Gentes. The titles of only about half the remaining forty-seven sections are known. Zoe. Sent to a convent. Theodora, who married Emperor John I Tzimiskes. Agatha. Sent to a convent. Theophano. Sent to a convent. Anna. Sent to a convent. ^ a b Moravcsik 1967. ^ Runciman 1988, pp. 47–48. ^ Runciman 1988, pp. 49–50. ^ Runciman 1988, pp. 49ff..
^ Ostrogorsky, George (1969). History of the Byzantine State. New Brunswick, NJ: Rutgers University Press. p. 278. ISBN 0-8135-0599-2. ^ S. H. Cross and O. P. Sherbowizt-Wetzor (trans.) (1953). The Russian Primary Chronicle: Laurentian Text. Cambridge, MA: Medieval Academy of America. pp. 82–83. ISBN 9780915651320. Constantine VII, De ceremoniis, ed. J. Reiske (2 vols., 1829, 1830). English translation 'The Book of Ceremonies' accompanying the Greek text in 2 volumes by Ann Moffatt and Maxeme Tall, Canberra 2012 (Byzantina Australiensia 18). Constantine VII, Three treatises on Imperial military expeditions, ed. tr. J.F. Haldon (1990). Ферјанчић, Божидар (1959). "Константин VII Порфирогенит". Византиски извори за историју народа Југославије. 2. Београд: Византолошки институт. pp. 1–98. Kazhdan, Alexander, ed. (1991). The Oxford Dictionary of Byzantium. Oxford University Press. Runciman, Steven (1988) . The Emperor Romanus Lecapenus and His Reign: A Study of Tenth-Century Byzantium. Cambridge: Cambridge University Press. Toynbee, Arnold (1973). Constantine Porphyrogenitus and his world. Oxford. ISBN 0-19-215253-X. Živković, Tibor (2006). "Constantine Porhyrogenitus and the Ragusan Authors before 1611" (PDF). Историјски часопис. 53: 145–164. Živković, Tibor (2008). "Constantine Porphyrogenitus' Kastra oikoumena in the Southern Slavs Principalities" (PDF). Историјски часопис. 57: 9–28. Živković, Tibor (2010). "Constantine Porphyrogenitus' Source on the Earliest History of the Croats and Serbs". Radovi Zavoda za hrvatsku povijest u Zagrebu. 42: 117–131. Wikimedia Commons has media related to Konstantinos VII Porphyrogennetos.